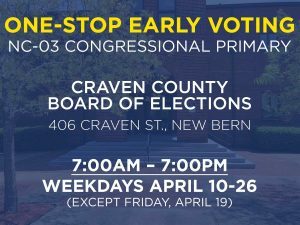 We’re looking for a few good people — people who are flexible, willing to work hard, and energized to turn Craven County blue! We’ll be electing a new group of county party officers at our 2019 convention, and we want to make sure we’ve got the best people! Do you think you have what it takes? If so, fill out this form to place your name in nomination! Don’t know what these job descriptions mean? Please see the County Officers job description page for details! Don't know what precinct you're in? Click here to find out! Please provide a 1-2 paragraph bio of yourself: where you're from, your life experiences, why you're a Democrat. Please provide 1-2 paragraphs outlining why you think you'd be a good fit for this position.